Can be used to measure any material by using the variety of amplifiers and electrodes available, from super-high to low sensitivity. A variety of products is available to meet a wide range of customer requirements, including flange types, high temperature, heavy loads, wire types, corrosion proof, pipeline types, and intrinsically safe explosion proof types. A lot of amplifiers are available to match the material you want to measure. By providing amplifiers that match each application, our products offer even higher reliability. You can replace the amplifier without disconnecting the cables. Eliminates problems caused by adhered material that had been a disadvantage of capacitance level switches. Explosion proof type (DS) is also available for explosion proof sites. 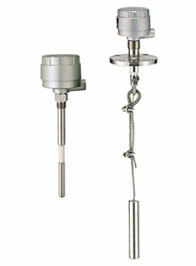 Separated-amplifier models are available for both explosion-proof and standard types. 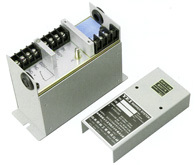 The DS type switch consists of an electrode integrated into an amplifier case with a separate power supply. It is an intrinsically safe explosion proof design when the power supply is installed in a safe location. The electrode and power supply are connected each other using a 2-conductor shielded cable. The electrodes are shared with the LT type. 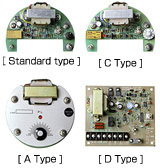 Separated types, with separate electrodes and amplifiers, are also available. The intrinsically safe explosion proof design means that any heat in a product cannot lead to an explosion, even if two breaches of safety occur. Furthermore, if any component in the equipment installed in a hazard area is shorted, it will not create a spark. This function has to be confirmed by an official institute using ignition tests and other criteria. This type is mainly used when the electrode position is subject to vibration. Use a coaxial cable to connect the amplifier to the electrode (up to 5m).